(CNN) -- Democrat Cory Booker and Republican Rand Paul are a rare bipartisan Senate pair who have found areas of agreement, but one issue remains deeply divisive for the two self-described friends: Hair. 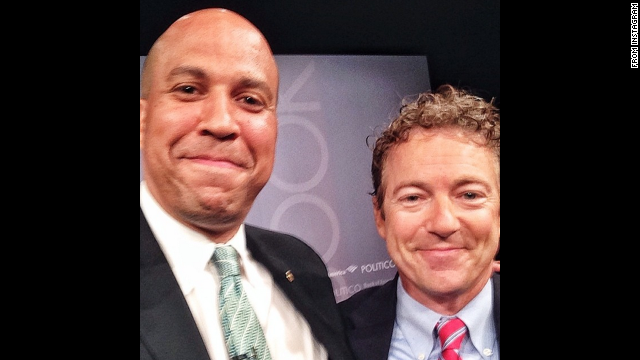 Booker, whose bald head often stands out on the Senate floor, in a Tuesday night tweet suggested the Kentucky senator should follow in his footsteps and get rid of his own distinctive head of curls.
.@SenRandPaul 1 grievance 4 U. SHAVE YOUR HEAD. Those curls are offensive. Plus If running for a higher office u'll be far more aerodynamic. The comment came in response to Paul's "Airing of Grievances" on Twitter earlier that day, a tradition that's part of the fictional holiday of Festivus, popularized by the television show "Seinfeld." Paul both tweaked Booker, for not re-tweeting him enough, and complimented him for their work together on various issues, including criminal justice reform. And Booker, in the spirit of the holiday, returned the compliment.